You can quickly open recently used items in Windows XP, and you can access all of your recently used items in one place — regardless of the application you used to create them. 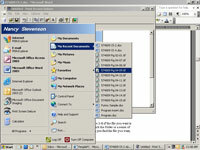 Finding your recently used items through Recent Items in Windows XP is the quickest way to open those files. Click the Start button in the lower left-hand corner of your screen. 2Right-click any blank area or the title bar. A good bet for a blank area is to try floating your cursor lower on the Start menu, close to the Start button. If you highlight an application while floating your cursor around, looking for a blank area, you can be sure that’s not a blank area. You can choose Properties from the resulting shortcut menu. 4Click the Start Menu tab. You can find the Start Menu tab in the Taskbar and Start Menu Properties dialog box that appears after you choose Properties. Likely, the Start Menu tab is already displayed. 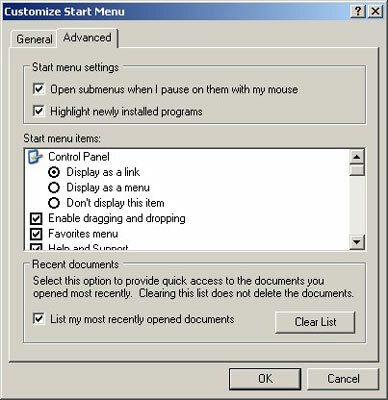 In the Customize Start Menu dialog box, display the Advanced tab. 6Select the List My Most Recently Opened Documents check box. The List My Most Recently Opened Documents check box may already be selected, so in this step, you’re just making sure that it’s selected. The first time you click OK, you close the Customize Start Menu dialog box. The second time that you click OK, you close the Taskbar and Start Menu Properties dialog box. My Recent Documents displays a submenu that lists your recently opened files. So to access the file you want, just choose that file from the submenu to open it. 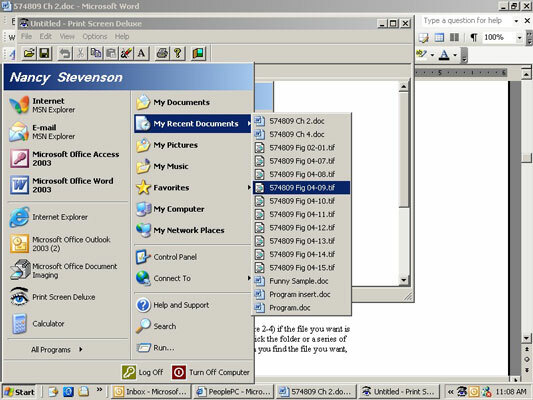 If a file in the My Recent Document list can be opened with more than one application — for example, a graphics file that you might open with Paint or Windows Picture and Fax Viewer — you can right-click the file and use the Open With command to control which application you use to open the file.